Rebutting the claims of President Obama and other top U.S. officials of “improved security,” death and destruction in Afghanistan are spiraling as the tenth anniversary of the U.S./NATO war approaches. On Aug. 6, 30 U.S. and eight Afghan troops were killed when their helicopter was shot down in Wardak province in eastern Afghanistan. It was the highest single-day death toll for U.S. troops since the war began on Oct. 7, 2001. The U.S. casualties were all special operations forces, 24 of them Navy Seals. Since the beginning of August, at least 41 U.S. troops have died in battle. Responding to the helicopter shoot-down, recently appointed Secretary of “Defense” Leon Panetta said, “We will stay the course to complete that mission, for which they and all who have served and lost their lives in Afghanistan have made the ultimate sacrifice.” Easy for Panetta to say, living in luxury thousands of miles away from the front lines of an increasingly brutal and seemingly endless war. The same day, U.S. troops attacked a home in Helmand province, killing eight Afghan civilians, including women and children, adding to a record-high civilian death toll in the country. Tens of thousands of Afghans have been killed since the war began. On Aug. 5, police opened fire killing at least four people in Qalad protesting another U.S. attack that killed three civilians. According to a U.N. report, 1,462 civilians were killed in the first half of 2011, 15 percent more than in the corresponding period in 2010. More than 2,600 U.S. and other NATO troops have been killed and more than 12,000 wounded—many suffering catastrophic brain trauma or amputations. An article in the March 4 Washington Post reported that U.S. military doctors now call double-leg amputations with accompanying genital injuries the “signature wound” of the Afghanistan war. In just the last few weeks, many top Afghan officials have been assassinated, including the mayor and police chief of Kandahar and the brother of U.S.-installed Afghan president Hamid Karzai. At a time when health, education and other vital government programs are being slashed or eliminated altogether, the war in Afghanistan devours $330 million per day. 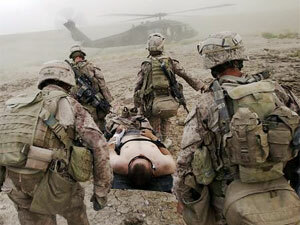 A recent study estimated that the total cost of the Iraq and Afghanistan wars will exceed $4 trillion—$4,000,000,000,000. The only way to end the bloody and rising carnage in Afghanistan is to immediately withdraw all U.S. and NATO troops and aircraft. The ANSWER Coalition has called for a protest and die-in on Oct. 7 in San Francisco, starting at the Federal Building, 7th and Mission Sts. To endorse and get involved, go to www.ANSWERSF.org, or call 415-821-6545. In Washington, D.C., ANSWER is part of the “Stop the Machine” coalition, which is organizing a series of actions beginning at Freedom Plaza on Oct. 6 (click here for details). Actions are also planned in Los Angeles and other cities to mark the 10th anniversary of the war. Only the people can stop the war—join us! In the coming months, ANSWER organizers and volunteers will be working to build the October demonstrations taking place across the country. Please make an urgently needed donation to help support the work of the ANSWER Coalition. We can't do it without your help.